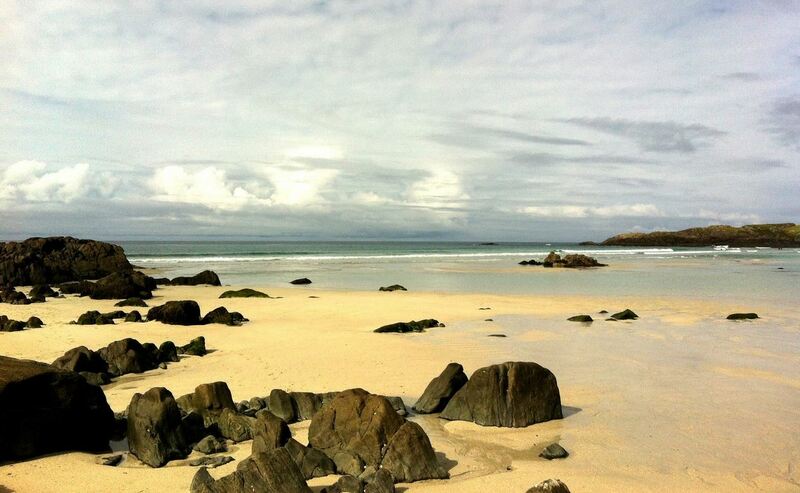 From the moment you touch down or step ashore on Tiree you know you have arrived at a very special place. Whether it is the coast that attracts you, with its sweeping white sand beaches and views across to the mountains of Mull; or the gentle pastures, a mass of colour from May through July, you are filled with a joyful sense of space and freedom. Surrounded by glorious beaches, and with plenty of wild Atlantic weather, you can either enjoy Tiree as a wonderful place to relax and "get away from it all", or as a destination with great conditions for some of the world's most exciting sports. Exploring the measureless boundary of the shore, you will attract the curiosity of basking seals as you marvel at rock pools teeming with life. The air is filled with the vigorous sound of birdsong and the roar or thrash of the breakers contrasts with the tranquil cove on the lee-side of the island where the morning catch of mackerel and lobster are brought ashore. In parts of western Scotland and the Hebrides some otters have become entirely marine. Islands offshore have been colonized where the otters feed exclusively on sea fish, crabs and other crustacea. They use rock crannies or caves as holts. Catch a glimpse of them when they come inland. A walk through the Tiree landscape is a chance to enjoy wildlife rarely seen on the mainland. Timid otters frequent the rocky coastline and freshwaters. In May and June you can hear the rasping call of the corncrake, one of Europe's rarest birds, from the windows of the Hynish Centre. Budding naturalists can seek out rare orchids and marvel at the range of bird species including the spectacular drumming displays of the snipe and the wonderful song of the skylark. You can see buzzards and peregrine falcons swooping over the high cliffs of Ceann a' Mhara. Here, after a short climb, you will witness the spectacle of thousands of seabirds; fulmars, guillemots, razorbills, kittiwakes and the like, that nest on the cliffs all around you and fill the air with their raucous cries. Explore the the surrounding countryside and in the late summer you will find grayling butterflies sunning themselves on warm rocks. Perhaps the most lasting impression of Tiree is the flowering of the Machair (rich seaside grassland) in May and June when you will see the pasture turn a brilliant yellow with a continuous carpet of buttercups and other tiny flowers. Wave sailing and windsurfing attract world-class competitors to the Tiree Wave Classic event in October. Sea kayaking, sand yachting and experimental sports like kite-surfing make Tiree a magnet for the energetic and adventurous. Those who enjoy gentle exercise might prefer a day out trekking on the Icelandic cross ponies, practising windsurfing in the safety of a shallow loch (RYA approved school), exploring the archaeological sites of ancient cultures, or having a round on the newly refurbished 9 hole golf course. For more energetic exploring bring your own bikes or hire them; cycling is easy going on level, well metalled roads. There is a good range of facilities on the island including car hire, shopping, a choice of restaurants featuring local lamb, seafood and other island produce, cafes, craft shops and potteries. Your trip would not be complete without a taste for local life in this Isle where English is often the second language to the native Gaelic. Students of island culture will enjoy An Iodhlann, the island's community archive in the Old Reading Room, Scarinish, a fascinating storehouse of local history including a digital collection of Gaelic folklore and songs. Stay at the Hynish Centre, which comprises Alan Stevenson House, (sleeps 20), Morton Boyd House (sleeps 8) and The Cottage (sleeps 6/8). Available all year round for families and groups of all ages, whether for recreational, educational, cultural or training purposes. At the Hynish Centre your group will enjoy a qualiy of accommodation and attractive prices that are hard to equal in the islands. Let the catering staff take the strain out of planning by providing breakfast, packed lunches and delicious evening meals to round off your day. Visit the Story of Skerryvore Lighthouse exhibition at Morton Boyd Hall to find out how Alan Stevenson (uncle of Robert Louis Stevenson) and the heroic engineers and keepers built and maintained the Skerryvore, Britain's tallest lighthouse, on one of Britain's most dangerous rocks, over 10 nautical miles out to sea. Also visit The Treshnish Isles natural history exhibition, housed in the Old Cow Sheds at Hynish, for an audio visual presentation of the enchanted Treshnish Isles, internationally important breeding ground for puffins, razorbills, guillemots and petrels.